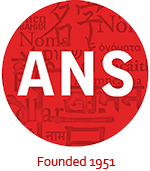 After posting the Call for Nominations for the 2015 Name of the Year, the ANS has already received a number of submissions. Read about the Nominations for Names of the Year 2015 in advance of the vote. The Name of the Year selection will take place on Friday, January 8th, from 12:00-1:00pm. Additional nominations will be accepted from the floor.